Joe Weissinger needed a kidney. Mary Wagner Bracciale read about his plight thanks to a friend sharing a Facebook post about it. In October, they both went under the knife at Thomas Jefferson University Hospital after Bracciale decided to be the living donor that her new friends so badly needed. The sun had just set a few blocks north of Oregon Avenue on a cold Tuesday in December. Inside a rowhouse decorated with Christmas joy, Joey Weissinger sat at the kitchen table, his 5-year-old eyes focused on the YouTube videos playing on an iPad. His baby sister Aubrie got comfortable in her high chair a few feet away, her smile so wide the walls could barely contain it. Their dad Joe – he sported an Eagles Super Bowl 52 Champions sweatshirt – was unloading bags from the car that his wife, Bridget, then drove around the corner to park overnight in the Sharswood School lot. Parking’s tight on their one-way, narrow block of South American Street, after all. Despite the hectic nature of getting everybody settled after a long day, the scene was Rockwellian, albeit one inspired by modern-day South Philly life. Then, without even a knock, a woman entered through the front door almost as if she owned the place, saying hello to everybody by name, making herself right at home. “You can see that we’re just like family already,” Joe said, offering a harbinger of things to come. If you didn’t know the backstory, you’d have thought everyone had known each other for years. In reality, though, members of the Weissinger family have known Mary Wagner Bracciale for just about three months. There’s a very distinct reason for that comfort level. Joe Weissinger had spent four years waiting for a new kidney and the opportunity to move off dialysis – and a year of actively searching for a donor on social media – when Bracciale parachuted, like a guardian angel, into the family's life from Conshohocken by way of East Falls. On October 16, a surgeon with Thomas Jefferson University Hospital sliced open her side and removed one of her kidneys. The organ was then taken into a neighboring operating room where it was placed inside Weissinger. The 43-year-old wasn’t on his death bed, but the membranous nephropathy had made it all but impossible to be the active person he wanted to be. 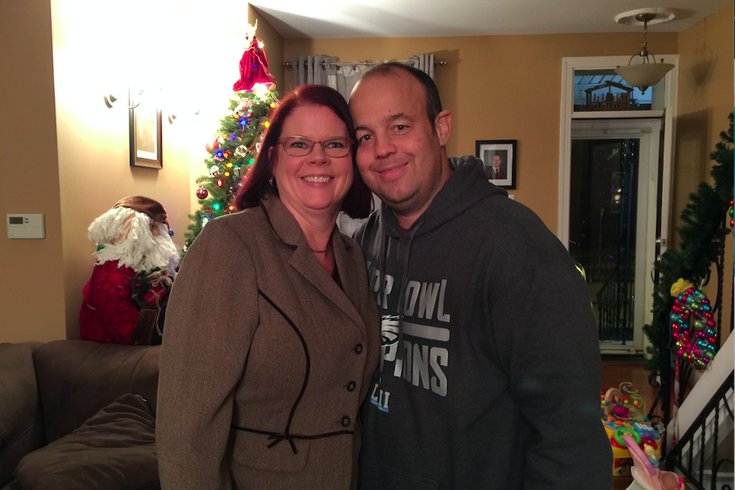 The transplant was a surgery designed to give Weissinger a new life or, more accurately, get back to the life he once had as a Mummer, youth football coach, father and husband. On this day – their eight-week anniversary of simultaneously going under the knife – the donor and recipient sat down next to one another on a living room couch to explain how kindness, compassion and happenstance congealed to form an unexpected friendship. The kidney donor and recipient wouldn’t meet until the morning of surgery, but their paths started on a trajectory toward crossing decades ago. Bracciale grew up in East Falls. Her best friend since first grade at the since-closed (and converted into lofts) St. Bridget School is a woman named Joanna Lippin Schultz. They’re still very close to this day. As fate would have it, Joanna would work with Bridget Weissinger at Jefferson. As work friendships go, theirs was tight, too. Joe’s path to needing a new kidney would start in 2009, when he noticed his feet were "awfully swollen.” A cardiologist referred him to a nephrologist, who diagnosed him with membranous nephropathy. After several years of treatment, Weissinger’s kidneys stopped functioning properly. He was hospitalized with pneumonia in 2014. Dialysis became “the only way for me to survive,” although a transplant would obviously be a game-changer. For three years, he kept the search private and was focused on deceased donors, rather than getting a living donation. “I didn’t want to put anybody out of their way,” he said, explaining that it didn’t feel right to ask living people to give him an internal organ. It was a matter of personal pride. As time went by and his body weakened, family and friends headed to Jefferson to see if they were a match. None would be. "People told me they were personally getting tested, but I wasn't getting calls," he said. "The hospital couldn't tell me who was coming in because of HIPAA laws." Weissinger also bided time on a transplant waitlist, something that resulted in several close calls. On Halloween 2017, the Weissingers made a decision that would ultimately change their lives forever, and for the better. 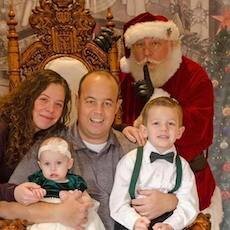 They set up a “Kidney 4 Joe” Facebook page with a simple plea: please get tested to see if you’re a match, because a kidney donation would save his life. Also, please like and share this page so more people see it. “Little did I know the match for Joe would be me!” Mary said. From that day forward, Mary followed Joe’s progress and regress closely over that Facebook page. It had an effect on her. She "liked" posts on it over the next several months – including those of the family heading out with the Riverfront Mummers N.Y.B. as Joey held a "My Dad Needs A Kidney" sign – knowing that she could potentially be a match since she was healthy and matched his blood type. “I kept it in the back in of my mind, but I had a vacation planned, the holidays were coming, I was in the middle of a big project, and insert any of life’s distractions here," she said. "I kept thinking about it. I waited for my mind to be quiet and for the distractions to simmer down. Joe Weissinger, 43, was diagnosed with membranous nephropathy several years ago and carried a sign in the 2018 Mummers Parade in search of a living kidney donor. The process started with a questionnaire and some basic testing. “I’m glad you didn’t,” Joe quipped. Dr. Pooja Singh, the medical director of Jefferson’s living donor program, which performs between 100 and 125 transplants annually, remembers Joe Weissinger from the first day he walked through their doors in 2014. She said the process usually centers on family members or friends making donations, but said it’s a troubling misperception that donor and recipient must be related by blood. At Jefferson, the process is set up so anyone can come in and meet with program coordinators to get the ball rolling the same day. Some do so with no donor in mind; many are there for a specific recipient, though. She said that social media campaigns like Weissinger’s have prompted many people to come in for testing in recent years. That's the situation into which Bracciale walked. Bracciale had an appointment set up at Jefferson for August 8, but still hadn’t told her husband, Jeff. They rented a weekly place for a quick summer trip in Stone Harbor a few weeks beforehand. That wouldn’t be the right time to spill. “I wasn’t going to tell Jeff while we’re on vacation. What if he reacts poorly and it ruins the whole vacation, which wouldn’t happen, since he’s not that kind of person,” she said. “Then, I had a ‘girls weekend’ down the shore. I thought I’d tell him when I got home from that, but I got home Monday and was too tired. That afternoon, Jeff asked about the appointment – like good husbands do. On August 17, she learned she was a potential match and could proceed with the rest of the testing, which is a long drawn-out process involving renal ultrasounds, chest EKGs, CT scans and the like, along with meetings with dietitians, financial counselors and surgeons. On September 24, she met with the surgeon who explained the procedure in depth for about 45 minutes before offering two dates: October 16 or November 6. “You’re lucky I chose the early one,” Mary quipped to Joe. With the surgery scheduled, Braciale headed home to tell her husband. But that wasn't the end of awkward conversations. She still had to get time off from work in information-systems consulting, possibly up to a month. Still wanting to keep the plan somewhat secret, she didn’t instantly tell her boss what the surgery was about but he got so worried that she caved. She swore him to secrecy as she was “on hyperspeed, trying to get things done at work” in advance of both a work conference in Florida and, upon return, the surgery. She still wasn’t telling anybody out of fear that Joanna would find out and piece things together, thus telling Bridget that her friend was donating a kidney to her husband. Meanwhile, Joe Weissinger had no idea any of this is going on. He was still doing at-home dialysis and hoping he’d regain the strength to play with his kids. Then came September when the hospital called to ask about his availability in the coming weeks. A living donor had been found. A kidney was there for Joe. "You're getting a kidney," he recalled being told. "Don't make any plans for that day." Then, he took to the social media site which, still unknown to him at this point, had played a defining role in his story. "The rumors are true. I HAVE A DONOR! Let me say that again, I HAVE A DONOR," he wrote in a Facebook post on October 1. "Man it feels so good to type that." Surgery at Jefferson's Nicoletti Kidney Transplant Center was scheduled for October 16, but he still didn't know the identity of his donor. Suffice it to say, that was a very important moment in Joe Weissinger’s life. It represented hope for a better future along with the mystery surrounding how it came to be. Before he and Bridget could embark on a mission to learn the identity of his donor, Joe had some calls to make and loose ends to tie up. “It’s the estrogen,” added Mary, further bolstering their newfound, sibling-inspired verbal exchanges. “Estrogen from your kidney and Dilaudid,” Joe added. The Weissingers' attention quickly shifted to identifying his donor, a mission made a little easier after the hospital told Joe that “the person found you through the Facebook page,” but offered no additional details. Complicating matters was the misguided impression that neither donor nor recipient wanted to reveal themselves to the other. They're not sure why, other than miscommunication with the hospital that “made it feel like she didn’t want us to know,” said Joe, with Mary echoing that sentiment in a reverse way. The silence would, of course, break, as these families were destined to meet and foster new friendships. For her part, Mary continued keeping an eye on Joe’s Facebook page to see how he’d react to the news. So was Mary, who would come face to face with Joe – he didn't know – two days later when they were both at Jefferson for pre-op testing. She recognized him in the waiting room; he didn't know her face … yet. It weighed on Joe as well, but the ice started to break when Mary followed through on her idea to send cards to Joe and Bridget in advance of surgery. Joe, Bridget, Joey, Aubrie and Joe's new kidney visit with Santa Claus. The cards were also sprinkled with a couple hints designed to lead them toward her identity. They alluded to a “Jefferson” connection, which Bridget used to whittle down to three very good friends from work, Joanna being one of them. The Weissingers figured the sender was female because, quite frankly, a male donor wouldn’t likely send greeting cards in that manner. Mary decided to further shatter that ice of uncertainty: she sent a private Facebook message revealing herself. On the Wednesday before surgery, they talked on the phone – which would be their most personal interaction before meeting face-to-face on transplant day. The night before surgery, Joe shared on his Facebook page a heartfelt letter that Mary had written from the transplant center. Among other things, it explained why she’d decided to do give up a part of her body to a stranger in need. Setting aside that she was almost ruled out the day before surgery because a liver specialist had concerns about some lab values, things went as smoothly as possible from there. It would be a sleepless weekend and night before surgery for the donor, who waited for Joe to post her letter before sharing her secret. After what seemed like the longest drive in history from South American Street to the Nicoletti Kidney Transplant Center near Eighth and Chestnut, Joe and Bridget were sitting in the waiting room when Mary walked in. Joe didn’t know that Mary had been worried that the test results would bring an end to the transplant before it happened. He’s happy he didn’t know, too. “There were so many things I wanted to say,” shared Mary of that moment. “She didn’t feel like a stranger,” Bridget added. “You and Jeff are such good people, so that makes it easier,” Joe said to Mary. Divided by merely a curtain, each was prepped for surgery. Mary’s operation started at 7:15 a.m. Though you’d think it would be a complex procedure, the laparoscopic surgery was minimally invasive, leaving her with just a tiny scar where surgeons removed her kidney. Joe’s would take a little longer, and involve a “hockey stick” type incision to give surgeons more access for transplanting the kidney. Dr. Ashesh P. Shah, a transplant surgeon, handled Mary’s surgery, with another peer waiting in Joe’s operating room. Social media, as in this case, has become a big player in matching potential donors with recipients because “stories like these often resonate with people” from afar, as opposed to social circles like churches or community groups in the past, said Shah, surgical director of the Kidney Transplant Program at Jefferson. “Mary and Joe did have a connection before the transplant, so I don’t know if they fall into the category of completely unknown strangers. They may have been at the same place before and wouldn’t even know it,” he noted, during a phone interview this week. With medical advances, it’s gotten substantially easier for those involved, particularly on the donor side, which doesn’t necessitate invasive surgery anymore. He said he always tells people that these are the most difficult surgeries he conducts because “you’re operating on someone who doesn’t have anything wrong with them." Mary’s four-hour surgery – which involves a large team of hospital personnel who don’t often get the credit they deserve – was pretty straightforward and “she really did great,” he said. Beyond the joy of helping a fellow human, Mary said she feels better and that the process helped her focus on losing weight, as she’d been trying to do for so long. “I need to take really good care of myself now,” she said. For Joe, dialysis is no longer a part of his daily regimen. Little Joey will remember those days, as the inquisitive youth asked all sorts of questions about the machine hooked up to his daddy so much of the time, but Aubrie will have to be told about these trying times. This wasn’t exactly a life-or-death situation for Joe. As long as he stayed on dialysis, he’d have lived “quite a few more years.” But that regimen puts added stress on your heart, especially when you’re doing it for more than three hours a day, five days a week like Joe was. Recently, he and Joey were waylaid by street closures for the Philadelphia Marathon as they tried to ride a bus from South Philly to see “Matilda” at the Walnut Street Theater. “The picture he posted of him and Joey that day, that’s it, that’s why I did it,” Mary said. “It makes me so happy." Sure, Joe wasn’t yet strong enough to sprint across the street with his young son in between runners, but he was able to walk countless blocks after detours prompted the bus to drop them off nowhere near the theater. 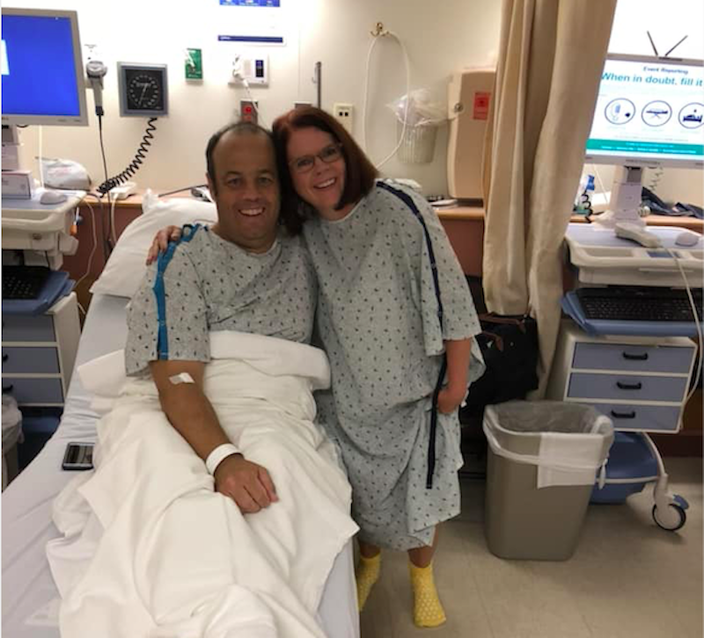 Joe Weissinger and Mary Wagner Bracciale are forever connected because of the kidney she donated to a total stranger who became a lifelong friend in October 2018. Joe has his life back. Bridget and the kids have their husband and father back. And Mary and Jeff have a new family of lifelong friends with whom they instantly meshed. Mary and Joe talked about what they consider to be the moral of their kidney transplant story. Both came back to bravery and the importance of swallowing one’s pride to ask for help. “More people should think about being a living donor,” said Mary, who urged people to register to be a donor and learn about kidney donation specifically. “Don’t be afraid. But, if you are, at least have it on your license (that you’ll donate after death). I don’t even feel like I had surgery. “If you’re in my situation," Joe said, before offering up some sausage and peppers that had been cooking all day, "know that there are good people out there and be willing to ask for help. For so many years, I didn’t even ask. Keep hope. 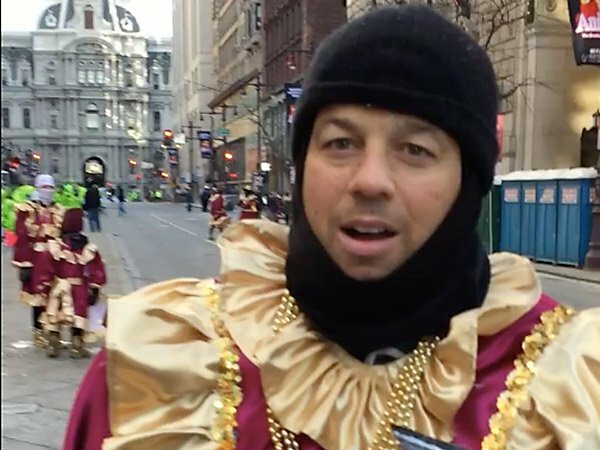 On New Year's Day, Joe will be out again with his Mummers troupe.